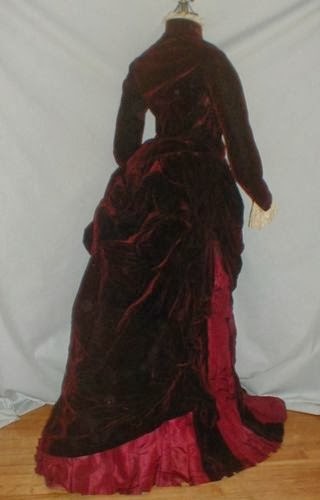 A rich 1870-1880 burgundy velvet and burgundy silk two piece bustle dress. The high neck collar and sleeve cuffs are trimmed with lace. The bodice is lined with cotton and has a front buttons closure. 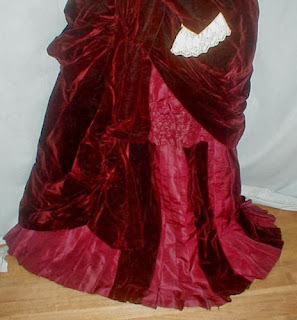 The skirt front has a draped apron panel and the back has a draped bustled panel. 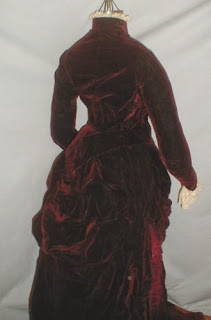 The front of the skirt has rows of pleated silk intermingled with bands of velvet. The hemline has rows of pleated silk at the front and back. There is a large silk ribbon bow and streamers on one side of the skirt. 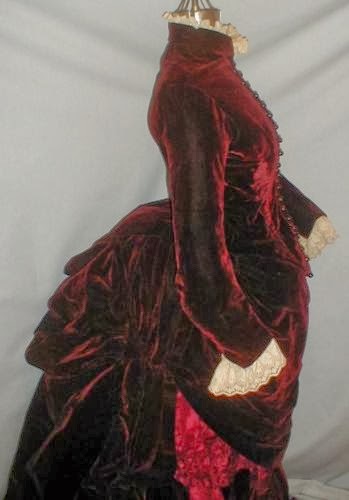 The skirt is lined with cotton. The dress is in very good condition. There are no splits or holes in the fabric. There is a small area of underarm discoloration mostly to the inside lining. The front darts on the bodice have been let out and will need minor re-stitching. There is some minor wear to the velvet in this area. Bust 34 Waist 26 Skirt length 44. 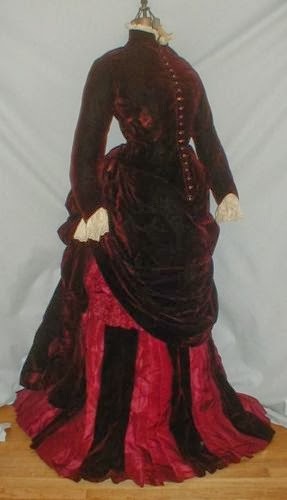 A beautiful display dress.